I love quilts – I love to look at them, and I love to create them. 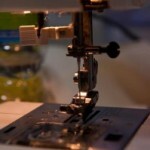 But sometimes my sewing machine sits idle for weeks at a time. The demands of life can be so great that I have trouble finding the time or energy to be creative. I tried to find a local community of quilters for camaraderie and support but had limited success. Then I found the inspiration I needed at the Mt. Airy Art Garage (MAAG). During Mt. 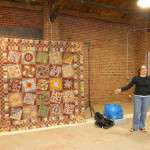 Airy’s “Final-ly Friday,” MAAG hosted “Quiltapalooza” led by Sarah Bond, local quilter extraordinaire. Sarah taught us how to make “string quilts” using fabric scraps. I fell in love with this quick and easy technique which produces colorful quilt squares without the preplanning involved in a traditional quilt. What fun! I also found the community I was looking for. Many of the other quilters were also interested in meeting on a regular basis to share ideas and inspire each other. Thus the MAAG Quilt Club was born. The first meeting of MAAG Quilt Club will be Saturday, June 30th from noon to 1:30. After that, our regular meeting time will be the 4th Saturday of each month. 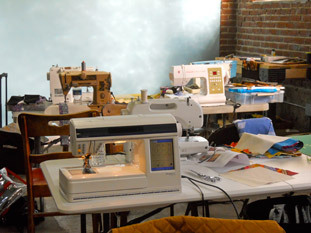 The group is free and open to all quilters – both members and nonmembers of MAAG. Donations are always welcome. If you know other quilters who would be interested in joining us, please invite them. We will have a “show and tell” at our 1st meeting (bring a quilt or one in progress) and will make plans for future meetings. Also bring a snack to share. For more information or to RSVP, contact Janet at 215-435-5977 or janmeyers@verizon.net.